We had a great day – great visits, perfect organisation, good weather and interesting discussions to make all the car journeys go by quicker! We have been honoured to have the Jane Austen Society of Lancaster County, Pennsylvania with us this week, and have delighted in visiting JA sites from her life and adaptations. The tour group enjoyed an evening of dance demonstration by the Hampshire Regency Dancers last night at Oakley Hall, where Jane Austen visited the Bramston family when living at Chawton. A good night was had, I think! And if you’d like a similar tour for your group, or even just for yourself, get in touch, we’d love to meet you! A wonderful evening with The Jane Austen Society of Lancaster County, Pennsylvania, at Oakley Hall Hotel. Showing them the Dances of the Pride And Prejudice Productions. The Dance in the Video is Shrewsbury Lasses, with its very own Mr Collins. 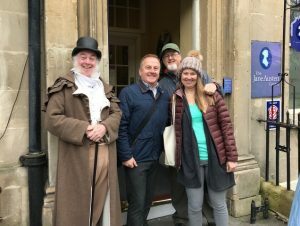 Classic British Drama Tours put together a Jane Austen/1995 BBC Pride & Prejudice locations tour for our visit to Bath and surrounding area. It was spectacular. We started with a walking tour of Bath taking in the beauty, the architecture and the history. Jamie, our tour guide for that part of our day, was incredibly knowledgable about Bath and its history, especially as it related to Jane Austen and the era in which she lived there. After a couple of hours our walking tour ended as we met Debi at the Jane Austen Centre for tea and refreshments. We set off for various locations from the BBC production including the town used for Meryton, the site of Darcy’s University scenes, the church where the wedding scenes were filmed and a glimpse of the house used as Longbourn and much more. This was a bucket list trip for my wife and thanks to Debi and her plan for the day, it even surpassed our expectations! Highly recommend Classic British Drama Tours. If we come back, we will be calling them again. Thank you, thank you, THANK YOU for a wonderful tour this week!!! We had the best time traveling with you and seeing the countryside. Thank you for taking us to all the beautiful sights and making our tour so much fun! Whet your appetite in readiness for the Downton Abbey movie due out in September 2019 by visiting Downton Abbey itself this summer! You’ll also see the surrounding beautiful English countryside, the village of Downton, the church, the ‘hospital’ and much more with a variety of tour options throughout the year! We can host tours just for you on any of the above dates. Please see our Premiere tour page for more details. Leave a Comment on Downton Abbey Movie! Your tour was certainly a highlight for me. It was an experience I’ll not soon forget! Just want to tell you again how much we appreciate the hard work you did to give us a great tour! We will remember fondly our many wonderful adventures! Thanks for being our Guide! It was a pleasure to meet you! We will collect your information upon booking with us. · How we secure your information – we destroy any financial data after we have used it to obtain payments for tours, PayPal has its own safety access so that your financial information is safe, and the electronic banking system also has it’s own safeguards. We rarely take credit card details. We have a database of emails which have been removed from our computer and are kept on an external drive to eradicate the possibility of any information being hacked. We keep a hard copy of booking forms that retain personal information in a locked unit. You can contact us at any time to remove or alter any information we have. You can contact us to remove your name from our mailing list for mail shots at any time. Should you wish to discuss any of our policies as detailed above please do not hesitate to contact us.